Of course, what caught my eye was a wonderfully sculptural natural form attached to the stopper of the bottle. 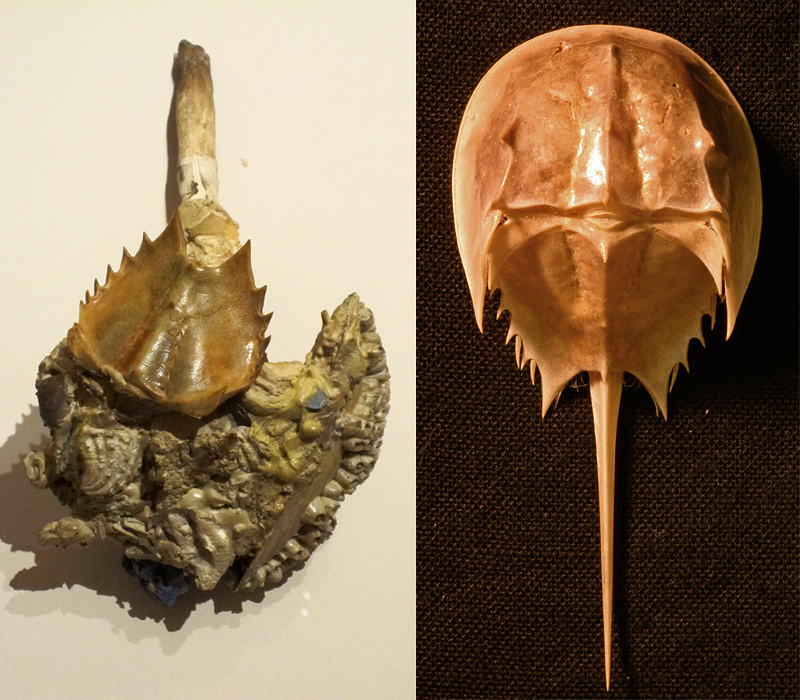 This elegant shape, above the barnacles and other encrusters, was the thoracetron of a horseshoe crab. 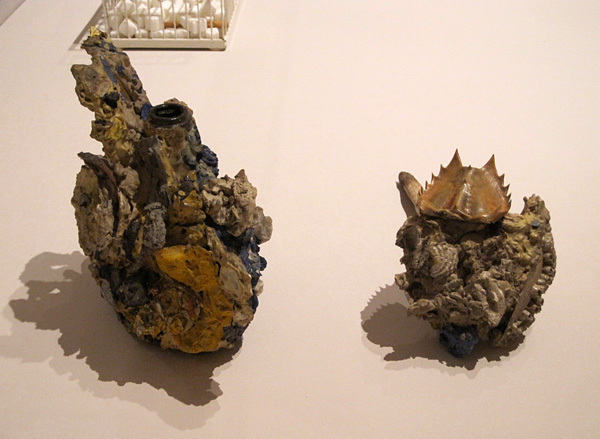 I had to know why or how this piece came to be, since it is the only modern art work I have seen that contains a xiphosurid (though other marine arthropods appear, such as in Salvador Dali’s Lobster Telephone). As I dug into the story of this Vail piece, I realized that it, like the Lobster Telephone is something of an artistic joke. In fact, based on my slender research I would venture to say that Vail’s bottle is very close to 100% joke. Lawrence Vail, or more accurately Laurence Vail, was the scion of an American artistic family, son of the famous painter Eugene Lawrence Vail. He was a writer and artist associated with the Dadaist movement, but perhaps more notable as a drinker who consorted with Ernest Hemingway and Ezra Pound. It was in this latter avocation that he attracted the attention of the New York Times, as he was arrested in 1926 for hitting a French captain, Allain Lemerdy, with a champagne bottle in a Montparnasse cafe. The possible jail sentence was dropped when, during negotiations between families, Lemerdy fortuitously fell in love with and became engaged to Vail’s sister. It might be as a result of this episode, or more likely a development from Vail’s longterm relationship with their contents, that much of his artwork seems to have been based on bottles. Many of these are unusual and interesting pieces, but in comparison with some of these other works the bottle in MoMA looks like a bit of a throwaway. I did not examine it thoroughly enough to determine how it was constructed, but it looks as though it may be a naturally-encrusted bottle discovered on a beach, augmented with a few additional items such as the horseshoe crab tail. As such, maybe it fits into such (possibly) found-art pieces as Marcel Duchamp’s brilliant Fountain, but as a museum scientist I have to say that I see it as an appropriation of voice more akin to Damien Hirst’s pickled creatures. I enjoy such works, I find them entrancing, but at the end of it all they are facile and completely shallow. I really think that the artists, like so many other humans, exhibit no affinity whatever for the creatures they have chosen to exploit, and this is a great pity. But perhaps someone else knows of a work that shows the soul of the crab? Text © Graham Young, 2011. The artwork shown is in the collection of the Museum of Modern Art, and the Limulus specimen is at The Manitoba Museum.